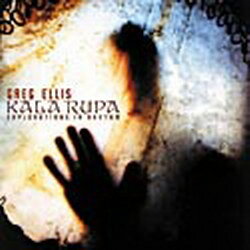 Greg Ellis, percussionist for the group Vas, presents KALA RUPA, his debut solo recording. Focusing on intense rhythms rather than melodic elements, Ellis offers ten slices of Asian mysticism centered around various types of drums. At Ellis' hands are the pulsating sounds of the frame drum, tabla, tanpura, riq, and dholak woven among the vocal beauty of Azam Ali and the cello of Cameron Stone. None of the tracks are given formal names, freeing the listener from any preconceptions the titles might bring and thus allowing the listener to draw their own conclusions about the music. KALA RUPA is a hypnotic, meditative journey into ecstatic drumming.